Raised under a mainly conservative, Catholic regime in Belgium, it was tantamount to being a revolutionary act for William Sweetlove to seek out “new media” art as a young man. With works along these lines having been forbidden or censored by the government, the rebellious Sweetlove found inspiration in the conceptual creations of Marcel Duchamp, Joseph Beuys, Robert Rauschenberg, Allan Kaprow, and Claes Oldenburg. But in 1968, Sweetlove witnessed the impact a revolution can have, as the Catholic University of Leuven‘s student protesters brought the government to its knees. And, ever since, Sweetlove hasn’t shyed away from personally exploring “new media” in his art or creating pieces with a subversive message. Following the philosophies of the archaeological artists who influenced him, Sweetlove’s early work in the ’70s began exploring objects as conceptual ideas and cultural artifacts. Wanting to make what he terms “fossils”, or works that could endure for an eternity, it was by chance that Sweetlove had been introduced back in 1968 by two engineers to a lasting material: synthetic resin. Initially employed in unison with photographs, Sweetlove’s autobiographical oeuvre from the time saw pictures of himself and family members, sometimes arranged alongside mementos associated with that moment, preserved in a resin casing. And in 1978, Roger D’Hondt offered Sweetlove his first solo showcase as part of a series of performance and installation art exhibitions at the avant-garde art center New Reform. Titling his participation in this “Action Cultural Fossil”, Sweetlove invited attendees to bury one of his works at the opening, the promise being that it would be unearthed a decade later. And that’s exactly what happened, done in the presence of an archeologist from Ghent University, the retrieved work’s housing having rotted and deteriorated while the resin coated photographs remained intact and untouched, seemingly impervious to time and no longer temporal. Having been awarded several prestigious art prizes and exhibited extensively in his native Belgium throughout the ’70s, Sweetlove’s introduction to the international art scene was gradual. Finding footholds of support in the United States, Netherlands, and France in the ’80s, the following decade would see Sweetlove’s recognition expand, thanks in part to the championing of the conservator for Belgium’s Provincial Museum for Modern Art (PMMK). By the early 2000s, he had become a member of the Cracking Art collective and contributed to large installations all over the world. And throughout all this time, Sweetlove’s artistic explorations continued to evolve and mutate. In the 1980s, Sweetlove began casting animal forms in resin, this direction becoming a commentary on overconsumption and overproduction. Inspired by the outbreak of mad cow disease, and its suspected link to the increasing use of artificial growth hormones to boost profitable milk and meat production, Sweetlove began referring to his brightly colored animal sculptures as “clones”. Referencing how some viewed artificial cloning as a means to mass-produce agriculture animals for food consumption, Sweetlove’s use of the term draws attention to the dangerous future this could create as well as doubling as a smart ‘excuse’ for the identical appearance of his animal-based works. But suggesting that cloning would become the meat factory of the future wasn’t the extent of Sweetlove’s ecological statement, especially as the effects of climate change started becoming an international concern. Over the next several years, Sweetlove reimagined his cloned animal creations into an all-too-plausible future, each gaining elements needed to survive an ecologically devasted world. Sometimes adorned with boots to trudge across the muddied earth from rising water levels, the artist’s creatures carry bottled and canned water, the only remaining drinkable resources. In other regions, unbearable heat has left deserts in its wake, Sweetlove’s beasts needing sneakers to tread on the arid ground, backpacks filled with food their only sustenance. Coalescing into the artist’s ongoing Water Wars series of installations and exhibitions, these cloned creations by Sweetlove encourage contemplation by the viewer of conservation and preservation, ways to avoid this dystopian future brought forth by global warming. But in considering Sweetlove’s genetically manipulated animal and plant works, there is an added element of the medium being the message, as all the synthetic materials used to create these “natural” subjects are environmentally friendly. Acknowledging that a world without plastics is no longer possible but that our means of disposing of these materials is the problem, Sweetlove’s sculptures are made out of recycled plastic salvaged from landfills or bronze taken from cargo ships that transported oil. Recently he’s even begun creating bag-shaped sculptures out of the remnants of discarded flip-flops. As such, Sweetlove’s more classical choice of a material for his newest sculptural editions seems, on the surface, out of place. Partnering with K.Olin Tribu, who have been casting outré art in Limoges porcelain since their founding in 2009, Sweetlove’s Cloned Marmots are reimagined into this natural, organic material associated with high-end, traditional decorative objects. And by casting his cloned animal in fine china, a medium whose initial use dates back 2,000 to 1,200 years ago, it lends the feeling of an ancient cultural artifact to the work. Essentially altering the piece’s message with the shift of material, it can be interpreted as Sweetlove saying that the road we’re on to ecological devastation isn’t new; that the attitude of mankind, for centuries, has steered us towards where we are now. 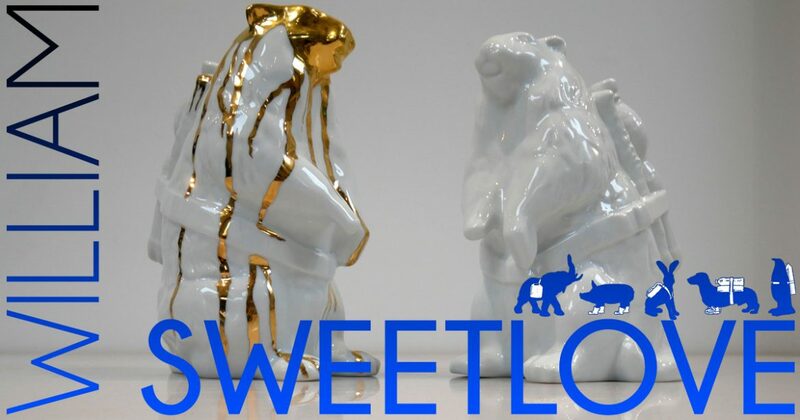 Click Here to Purchase William Sweetlove’s Marmot Porcelain pieces.